Exotic birds soar in a lime green sky, attracted to vibrant lilies. By Nikom, this colorful hand-painted parasol is crafted of bamboo and handmade saa, or mulberry bark paper. Open: 68 cm H x 84 cm Diam. Open: 27" H x 33" Diam. Closed: 68 cm H x 7 cm Diam. Closed: 27" H x 2.8" Diam. 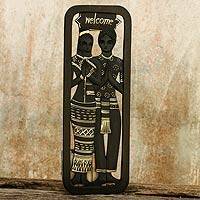 Artfully crafted by Nikom from Thailand. "The doors to our workshop are open to the public, so that everyone can come and learn about the manufacturing and decorating processes." 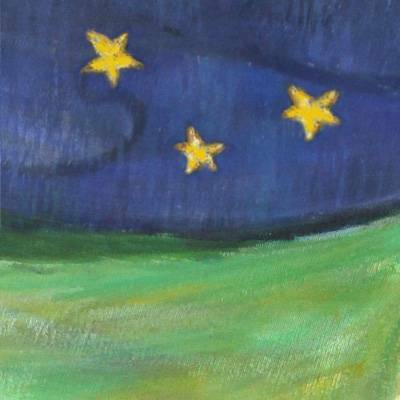 "You used to know me through Wicharn Wongkham, a very skilled painter who worked with me. But now that he has left for greener pastures, I would like to introduce myself. 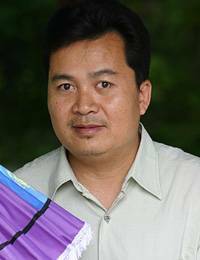 My name is Nikom Boontunjeen and I was born in northern Thailand in the early 1960s. 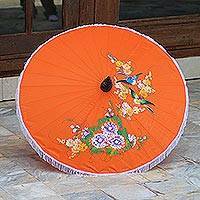 I grew up in a village known for their saa paper parasols. I enjoyed a peaceful childhood. 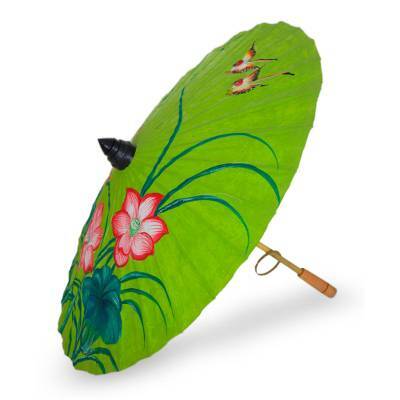 I was a regular and filial country child, and often helped my parents crafting umbrellas. "I studied in Bangkok, then I came back home and set up my saa paper and umbrella workshop in the late '80s. It was a good decision for my parents, my family and the neighboring villagers. "It was also very inspiring to work with family and friends who shared the same interest. We improved the design as well as the patterns, and changed stages in the procedure and techniques in order to improve the quality. The doors to our workshop are open to the public, so that everyone can come and learn about the crafting and decorating processes. When demand for our products is great, I dispatch work to people living nearby. I think this has a major impact on their life because it can be a part time or full time job. And for those who already have a job, it can be a way to earn extra money. 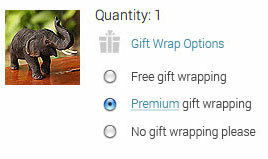 I provide them with the design and raw materials. This way they work at home with their family, at their own pace, without stress, without the burden that comes with business responsibilities. Moreover they do not need to leave their homes to find work in larger cities, living uprooted and far away from their loved ones. 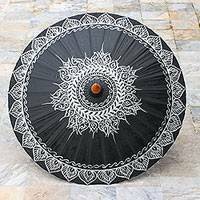 "Today, although I still mainly craft umbrellas, fans, and accessories made of saa paper and fabric, I try to diversify with other lines. I tend to keep to traditional Thai patterns, but I also have been creating new designs, either my own ideas or suggested by customers. I am proud to say that my products are traditional, decorative, useful, and locally made. "I am married and we have two children. I would like us to travel, see our country and the world, but I want to improve my craft first. 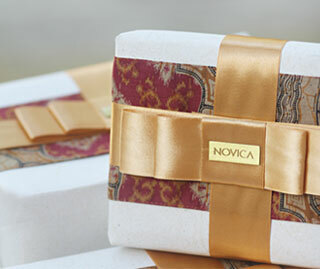 I hope people around the world will enjoy the products I sell through Novica." 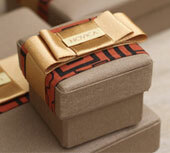 Saa paper has been handmade in Thailand for more than 700 years from the bark of the mulberry tree. 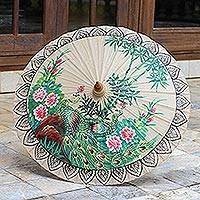 Originally, it was used as a filter in the making of lacquerware, but it is today used for Buddhist scripts, temple decorations, umbrellas, fans, and kite making. The largest concentration of mulberry-trees is to be found in the Northern Thai forests. The saplings are coppiced and the bark is stripped from the branches and dried. The smallest branches produce the best quality bark and it takes therefore a full day for one person to harvest just ten pounds of good quality washed and dried bark. Because the mulberry tree is a fast growing variety, the branches, once cut, are quickly replenished and can be cut again the following year, while the tree itself lives its natural course. The bark is soaked in clear water for about 24 hours. Then it is boiled with several kinds of ashes in cauldrons over a naked flame to soften the fibers. It is left to cool and soak overnight and then rinsed many times until clean. Dyes are added if necessary and the fibers are beaten to a pulp with mallets. Fibers are then put into a tank of clean water and stirred with a paddle until they are suspended in the water. They are hand-sifted with a screen, and the screen full of fibers is placed in the sun to dry. The fibers on the screen become a sheet of paper that can be peeled off easily.